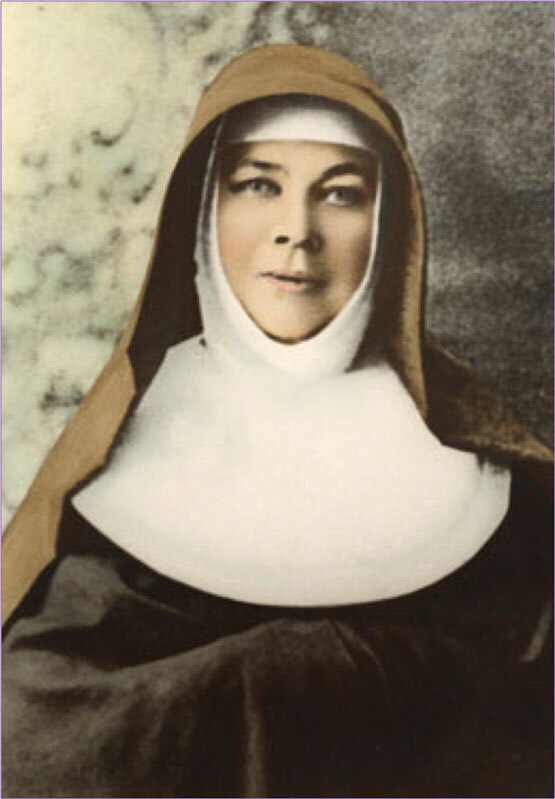 On January 15, 1842 Mary MacKillop was born of Scottish parents, Alexander MacKillop and Flora MacDonald in Fitzroy, Victoria. This was less than seven years after Fawkner sailed up the Yarra, when Elizabeth Street was a deep gully and Lonsdale Street was still virgin bush. A plaque in the footpath now marks the place of her birth in Brunswick Street, Fitzroy. Mary, the eldest of eight children, was well educated by her father who spent some years studying for the priesthood in Rome but through ill health had returned to his native Scotland until 1835 when he migrated to Australia with his parents. Unfortunately, he lacked financial awareness, so the family was often without a home of their own, depending on friends and relatives and frequently separated from one another. From the age of sixteen, Mary earned her living and greatly supported her family, as a governess, as a clerk for Sands and Kenny (now Sands and MacDougall), and as a teacher at the Portland school. While acting as a governess to her uncle’s children at Penola, Mary met Father Julian Tenison Woods who, with a parish of 22,000 square miles/56,000 square kilometres, needed help in the religious education of children in the outback. At the time Mary’s family depended on her income so she was not free to follow her dream. However, in 1866, greatly inspired and encouraged by Father Woods, Mary opened the first Saint Joseph’s School in a disused stable in Penola. Young women came to join Mary, and so the Congregation of the Sisters of St Joseph was begun. In 1867, Mary was asked by Bishop Shiel to come to Adelaide to start a school. From there, the Sisters spread, in groups to small outback settlements and large cities around Australia, New Zealand, and now in Peru, Brazil and refugee camps of Uganda and Thailand. Mary and these early Sisters, together with other Religious Orders and lay teachers of the time, had a profound influence on the forming of Catholic Education as we have come to know and experience it today. She also opened orphanages, providences to care for the homeless and destitute both young and old, and refuges for ex-prisoners and ex-prostitutes who wished to make a fresh start in life. Throughout her life, Mary met with opposition from people outside the Church and even from some of those within it. In the most difficult of times she consistently refused to attack those who wrongly accused her and undermined her work, but continued in the way she believed God was calling her and was always ready to forgive those who wronged her. Throughout her life Mary suffered ill health. She died on 8th August, 1909 in the convent in Mount Street, North Sydney where her tomb is now enshrined. Since then the Congregation has grown and now numbers about 900, working mainly in Australia and New Zealand but also scattered singly or in small groups around the world. The “Brown Joeys” may be seen in big city schools, on dusty bush tracks, in modern hospitals, in caravans, working with the “little ones” of God – the homeless, the new migrant, the Aborigine, the lonely and the unwanted, in direct care and in advocacy, in standing with and in speaking with. In their endeavours to reverence the human dignity of others and to change unjust structures, the Sisters and those many others who also share the Mary MacKillop spirit continue the work which she began. This great Australian woman inspired great dedication to God’s work in the then new colonies. In today’s world, she stands as an example of great courage and trust in her living out of God’s loving and compassionate care of those in need.